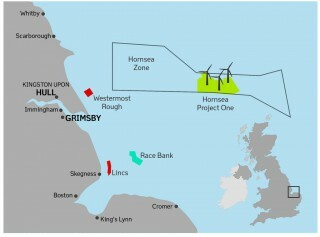 Het Hornsea One Windpark wordt gerealiseerd voor de kust van Yorkshire bij Grimsby in Engeland en moet in 2020 klaar zijn voor gebruik. Het windpark wordt ontwikkeld door Ørsted (voormalig Dong Energy) en krijgt een capaciteit van 1,2 gigawatt.Wanneer het windpark online komt, moet het in staat zijn om ongeveer 1 miljoen huishoudens van duurzame energie te voorzien. Na Hornsea One gaat men werken aan Hornsea Two, een offshore windpark dat nog groter wordt met een capaciteit van 1,4 gigawatt. Genoeg om een slordige 1,3 miljoen huishoudens van energie te voorzien. Hornsea Two komt op ongeveer 89 kilometer voor de kust van Yorkshire. Men verwacht dat Hornsea Two in 2022 operationeel zal zijn. Om het Hornsea Windpark te completeren, staat Hornsea Three ook nog op het programma. Dat project moet een capaciteit krijgen van maar liefst 2,4 gigawatt. Als alles allemaal volgens is gerealiseerd heeft het Hornsea Windpark een capaciteit van maar liefst 5 gigawatt aan duurzame energie. Maar daarmee is het project nog niet afgerond. Er is nog voldoende ruimte in de Hornsea Zone om Hornsea Four en wie weet Hornsea Five te realiseren. The world’s largest offshore windfarm, which has the potential to power more than one million homes, is set to be built off the north-east Lincolnshire coast. 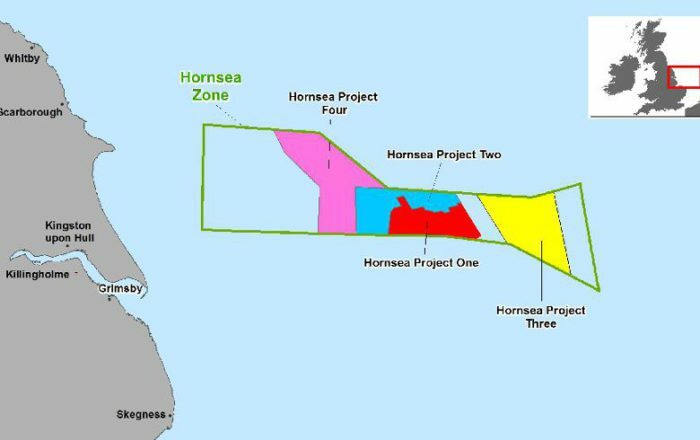 Hornsea One has been given the go-ahead after Ørsted confirmed a final investment decision on the offshore farm to be located around 120 km off the coast of Grimsby. Hornsea One, which the department of Energy and Climate Change said will be the world’s largest offshore wind farm will cover around 160 square miles at a capacity of 1.2 gigawatts. The project is expected to be completed by 2020. Siemens Gamesa Renewable Energy has announced it has been awarded the contract to supply the wind turbines for the 1,386 megawatt Hornsea Project Two offshore wind farm which, upon completion, will be the largest offshore wind farm in the world. When you combine Projects One and Two together, you already reach a capacity of 2,586 MW. As of the most recent update from Ørsted published in February, Hornsea Project Three could have a capacity of up to 2,400 MW, which if fulfilled would result in an increase of 66% on the original estimates for the Hornsea Offshore Wind Zone back in 2015. This is due primarily to the astonishing cost decreases in offshore wind technology coupled with the development of wind turbines capable of ever greater generation. Danish energy group Ørsted has been finalizing contracts for its 1.4 GW Hornsea Project Two recently, signing a wind turbine supply order with Siemens Gamesa Renewable Energy in late June to provide 165 of its SG 8.0-167 DD wind turbines. Ørsted, or DONG Energy as it was at the time, acquired the rights to the Hornsea offshore wind development zone back in August of 2015, having already acquired the Hornsea Project One offshore wind farm development from the SMart Wind consortium earlier that year. The project was originally conceived as a 1.8 GW megalith but has since been scaled down to 1.4 GW, and is expected to begin construction in 2021.